Beirut (AFP) - The UN's Syria envoy Thursday discussed his peace proposals in Damascus, as Washington said it was open to talks with Moscow even as concerns grow over Russia's growing military involvement. As the diplomatic gears turned, regime helicopters attacked a rebel-held town near the flashpoint city of Daraa with barrel bombs, killing at least 21 civilians including women and children, a monitor said. The attacks came only hours after Western powers condemned the regime of President Bashar al-Assad for similar strikes on Aleppo city, in the battered country's far north. Meanwhile, in Damascus, Staffan de Mistura met Foreign Minister Walid Muallem in search of an end to a four-year-old war in which more than 240,000 people have been killed. "We will continue the meetings," the UN's pointman on Syria said after their talks, declining to elaborate. According to state news agency SANA, de Mistura and Muallem addressed the government's questions about the envoy's proposed 60-page peace plan. The initiative, set to begin this month, would set up four working groups to address safety and protection, counter-terrorism, political and legal issues and reconstruction. But de Mistura said the groups' work would be "for brainstorming and would not be binding", according to his office. Syria's regime had not wanted the committees' conclusions to be mandatory, a diplomat in Damascus said. 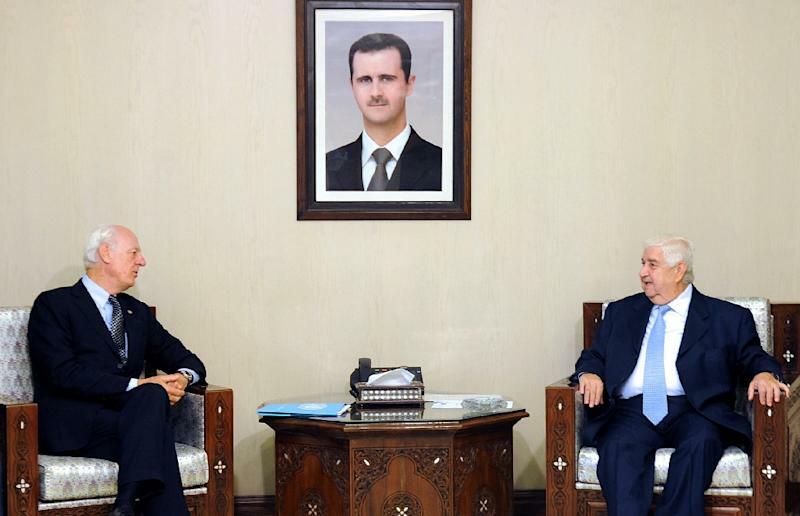 Muallem for his part said "fighting terrorism in Syria is the priority" and "the gateway to a political solution". De Mistura also met with internal opposition figure Hassan Abdel-Azim, who said he was ready to participate in the envoy's plan. "But fighting terrorism demands first the end of the conflict between the regime and the opposition," Abdel-Azim said. Al-Watan newspaper, close to the government, said the regime and Russia were "on the same page concerning the solution to the crisis" but that the UN had different priorities. The Syrian and Russian leaders "have signalled that there is no political solution without defeating terrorism. It's the only way to put an end to the war in Syria," it wrote. But it said de Mistura's plan "is aligned with the positions held by the 'opposition coalition,' America, Turkey, and Saudi Arabia, who want the political solution to come before the fight against terrorism." The United States, Turkey, and Saudi Arabia have been leading backers of the opposition since Syria's conflict broke out in 2011. Washington has expressed serious concern that Russia, a decades-long backer of Syria's regime, is escalating its military aid to forces loyal to Assad. But White House spokesman Josh Earnest said the United States could be willing to take up a Russian offer of talks so long as they were "tactical, practical discussions". It was not immediately clear whether the discussions would be held by the military or civilians, or at what level. Military dialogue between Russia and the United States had been suspended since 2014, following Moscow's annexation of Ukraine's Crimea peninsula. The White House said it would use the talks to urge Russia to focus its actions in Syria on countering the Islamic State (IS) jihadist group. Russia has reportedly moved artillery units and tanks to an airport in Assad's coastal stronghold in Latakia province, along with dozens of personnel and temporary housing for hundreds more. In an interview with Syrian state television, Muallem said Russia was ready to help Syria "fight terrorism," but denied Moscow was getting involved in "Syria's internal affairs". US Secretary of State John Kerry said Wednesday that Moscow had proposed opening a "military-to-military conversation" to ensure Russian forces do not come into conflict with the US-led coalition fighting IS. Experts said Moscow's staunch backing for Assad combined with the arrival of thousands of Syrian asylum-seekers may push Europe to adopt a new approach towards the regime. "Indeed, after the migrant crisis, we heard several European voices pleading for a closer cooperation with Assad and (Russian President Vladimir) Putin," said Karim Bitar, head of research at the Institute for International and Strategic Relations. "Clearly, the 'stability at all costs' narrative is rapidly gaining ground." 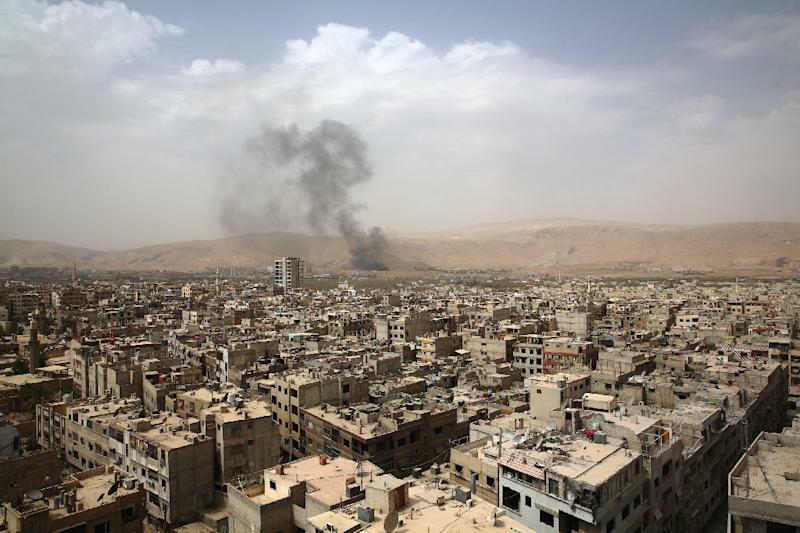 On Thursday, government air strikes on Raqa, IS's de facto capital in Syria, killed 18 people, including jihadists and civilians, the Syrian Observatory for Human Rights said. 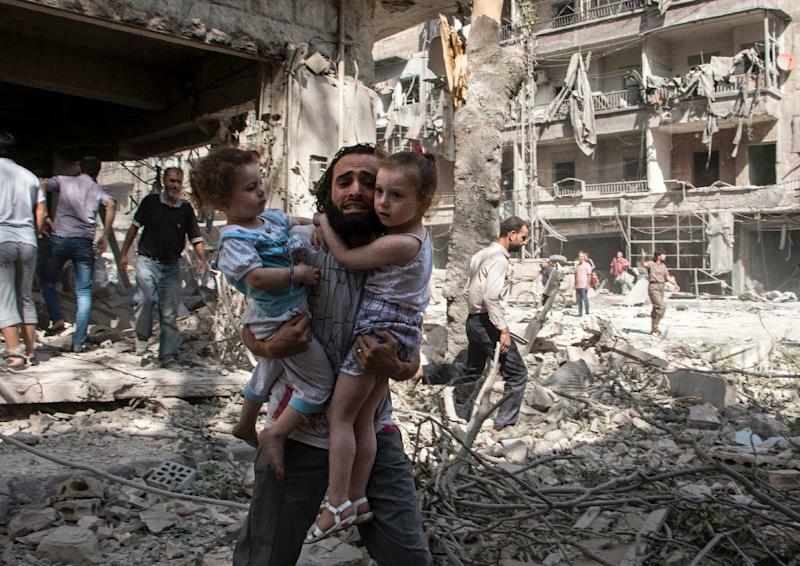 Regime air raids on Aleppo city in the last 24 hours also left 53 people dead, including 13 children, the monitor said. And barrel bombs dropped by regime helicopters on Thursday killed 21 civilians, including two children and four women, in the southern town of Busra al-Sham near Daraa, the cradle of the uprising against Assad's rule. The EU commissioner for humanitarian aid, Christos Stylianides, issued a statement on Thursday to "strongly condemn" attacks on civilian areas.